When Patrick Wiggins isn't contacting newspapers and TV stations about the latest solar event or educating Tooele schoolchildren on physics, he might be skydiving or planning his first base jump—and, on Aug. 14, he'll be in Washington, D.C., receiving the Distinguished Public Service Award from NASA. The award, the highest that NASA gives to civilians, is in honor of the 65-year-old amateur astronomer and part-time pilot's work as a NASA Solar System Ambassador. 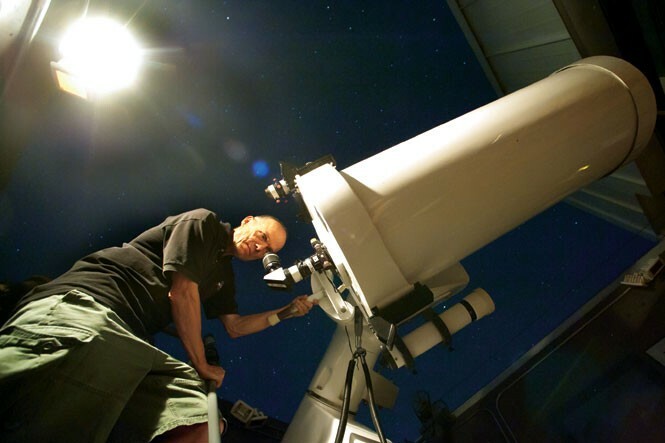 For more about Wiggins and the latest astronomy news, visit UtahAstro.info. What's so interesting about space? That it's there! Since I've been a kid, I've been enamored with the sky—looking through a telescope and seeing Saturn for the first time; I can still remember actually doing that when I was just a little teeny kid. When I was in my early teens, my mother bought a telescope for me—a piece of junk, it turned out to be. That did kind of kill my interest; it was so clunky and hard to use, and it didn't work very well. When I got off active duty from the Air Force and was going through civilian flight school in Oklahoma, that's when Comet Kohoutek came around, in 1973. It fizzled, but that's what rekindled my interest in astronomy. We work through NASA on educating the public about space and astronomical events. When there's something happening astronomy-wise, I contact the media. I think that probably most of what I do is tell people what's going on—"There's going to an eclipse"—or talk about an occasional meteor shower, or even something simple like, "Go out tonight and Venus is right next to the moon." People will probably see that without my telling them, but they wouldn't know what it was. Or they'll find out, and go out and look. Getting people to look up—that's what we want. We need more scientists. I wish this country was more science literate. Too many people have the idea that science is dull and boring. I go into a school and say, "We're going to do science today," and there's invariably a few kids who groan. But then I start doing the program, and those same kids are laughing, jumping up and down, clapping. Then I'll hear from the teachers that those kids just won't shut up about the experiments we did. That's what we're looking for. Most adults, especially my age, they are going where they are going. So let's get them when they are young, and show them that science is fun. It may be that NASA decides to sidestep the moon and go straight to Mars. I think that during my lifetime, if I live to be a normal age, I'll live long enough to see humans at Mars. I like free enterprise, and there are a few companies that are actually working on putting people in space. Spaceport America in New Mexico has already built the runway and all the facilities, and a guy down in the Mojave desert is building a spacecraft, and starting at the end of this year, you'll be able to buy a ticket and be shot into space. SpaceX, another private company, is now supplying the space station. Now they are kind of saddling up to NASA. Private enterprise—I really do think that's the way of the future. Kids today, assuming things continue the way they are, will be going on vacations in space in 20 to 30 years, maybe less. Why did you become an SSA? I spent over a quarter of a century at the late, great Hansen Planetarium. I applied to be a SSA just before I retired from there in 2002. I applied to the program as a way of getting more training, because you get a lot of that with the ambassador program. I've got around 250 of these trainings, they're called telecons, on my computer. I keep them for information later. And it works out great because if I'm going to go do a talk on something, I can go back and find some authoritative source.